Need a Volvo mechanic? We take pride in offering you the best service possible at an affordable price. We are an independent, family owned and operated business and we proudly employ a very friendly and knowledgeable staff, Phil Tanner our Parts Counter Manager / Service Advisor, has been in the business with over 19 years of experience and can assist you with any of your service or parts needs. 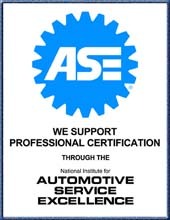 We are Volvo specialists: we have some of the best factory trained, ASE Certified, Master Technicians. Phil Tanner, our shop foreman, has over 19 years experience working exclusively with Volvo cars. We provide the highest quality of service and repairs using Genuine Volvo parts. We take pride in having a clean and comfortable waiting room with cable TV, various magazines, daily newspaper and a secured free WIFI access point for those that just want to surf the web or get caught up on some work while waiting for your vehicle to be serviced or repaired. Take one look in our shop and you will see a very clean, safe and organized work environment. We are not happy until you are happy. So if you are looking for a great Volvo mechanic, we are the place to have your car serviced or diagnosed and repaired the first time, with guaranteed work backed by our one year unlimited mileage warranty (used parts or wear items covered under different warranty terms) then come see what sets us apart from the rest and be our customer for the life of your Volvo. Looking for a great car? Copyright 2009 Volvo of Gwinnett | Volvo specialist. All rights reserved. Extended warranty? No problem we work with most extended warranty contracts.